I purchased the Locus Gear Khufu in silnylon, because of my addiction to sleeping up above treeline. I was in need for a shelter to add to my gear list, which provided protection from swirling winds in the Olympic Mountains. Wind, heavy rain and snow is common on the Olympic Peninsula at high elevations, even in summer. Pyramid tents give you a better option of being able to sit up inside, compared to a dome style shelter. Reaching out to the internet world, doing a bit of research over various shelter options and finally seeing one with my own eyes. I decided that the Locus Gear Khufu Sil would be the right choice for me. Placing the order to Japan during the winter months; which happens to be almost one year ago to date. During this time, I have given this shelter heavy use during my four season overnight trips into the Olympic National Park, well as some southwest use in Utah. This was my year around weekend trip refuge, well as primary home for my extended trek in the Olympic Mountains. On this series of long walks, I slept in wilderness for 41 nights. Waking up to some snow. This was my first overnight trip with the Khufu. The first thing I do when looking for a place to sleep for the night. Is walk around and look for the best place in the area to pitch. Checking wind direction, high ground for your body to lay and account for what water is going to do after it runs off the shelter. Obviously not wanting water entering the area where you're trying to sleep. Secondly is to have four corners at even heights to pitch your pyramid. This is not 100% necessary, but the structures shape will be compromised; sometimes affecting headroom, depending on the situation (seen below). 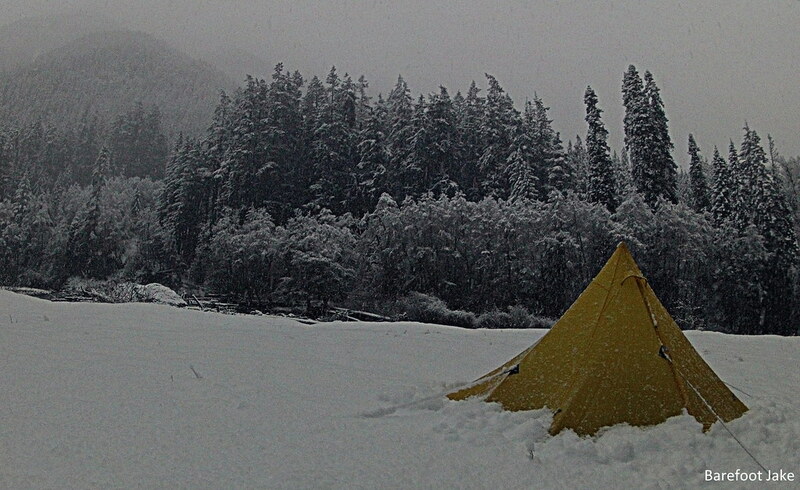 Early spring snow camping trip below Mount Angeles. You can see my site selection is at fault, causing an uneven pitch. Its not always easy to find the perfect spot for the night, but its nice to make it work. Shown here using DPTE. This is what worked best for me during pitch. 1: Both stakes 1 inched toward door from 45 degree angle of corner. 2: same as one. 3: single pole or DPTE. 4. Stake windward wall. Keep an eye on center pole; not to pull it over too far. 5: Stake out door slightly toward; slightly off towards zipper, to remove wrinkles. Pro Tip for Sil version: Retighten all stake points before sleep to prevent sagging overnight. Like all single wall shelters, you are going to feel moisture on the inside surface, unless you properly ventilate; especially in a super wet environment, like the Pacific Northwest. Leaving airspace between the ground and bottom of tarp; helps combat this issue. I would often leave the door open completely, during fair weather or light rain. This gives the moisture, well as your body heat a chance to escape. Condensation gets trapped on the under surface; during wind or heavy rain, will be broke loose and fall as mist on the inside of the shelter. Proper ventilation helps against this 'spray' effect. Khufu in Utah. Pitch was challenging in soft sand. Ended up using long sticks and rocks to get me by. 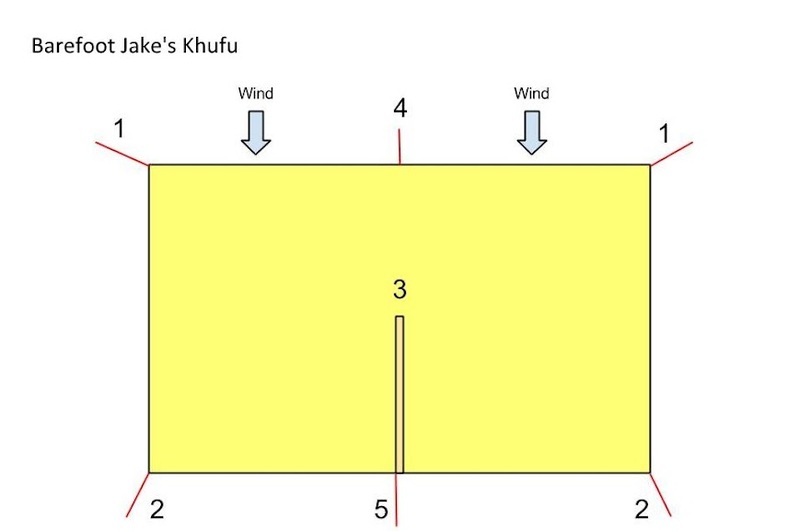 I have not had to seam seal most of the Khufu, accounted to quality design and craftsmanship. However the seam that constructs the vent hood, had to be sealed. I would experience leaking during a heavy rain, have since repaired this issue. Also had to do wilderness self repair on the little tab used to hold open the door. Maybe because I always leave the door open? The stitching began to fail, so I did a poor job at reinforcing that issue. Overall I am impressed by the Khufu. Every stitch and item on the shelter; all having a purpose. Views of the Burke Range and Mount Anderson, during day 2 of an off trail traverse. I do not walk with trekking poles, so I end up carrying Locus Gear's 3 piece pole always in my backpack. For this reason, I seldomly construct the Khufu with 2 poles with the Locus Gear DPTE; which allows you to pitch with 2 trekking poles, in an A type frame. Personally only using for two adults or winter conditions; for greater wall stability. Always get frustrated of how the pole extender coupler fit together and always comes apart on me. 4 days at Cape Alava with my son. Shown here using DPTE. Little tight on length. I am 5.11" and sometimes rub the walls; depending on pitch. Who would I suggest use this? Anyone looking for solid for season protection from all directions. Easy to pitch in a windstorm. Don't mind spending a little extra, for a unique quality constructed ultralight shelter. Having the option to use one or two poles is an added bonus. The Locus Gear Khufu Sil is the perfect solution for someone looking for four season protection in an ultralight shelter. Its is the right size to fit in most campsites; which is a selling point to me. Disclaimer: Barefoot Jake purchased this shelter at full price from Japan. He was under no obligation to write this review. He did so out of his own opinion.